Editor's Note: This is a summary of an article from the Philippine Center for Investigative Journalism entitled "Pre-campaign ads: P6.7B" Part 1 of 3, originally published on their blog. According to Nielsen Media’s monitoring reports – to which PCIJ has subscribed – a total of 108,573 “social concerns" ads worth P7.75 billion, by the media agencies’ rate cards, were aired and published from Jan. 1, 2015 to Jan. 31, 2016. 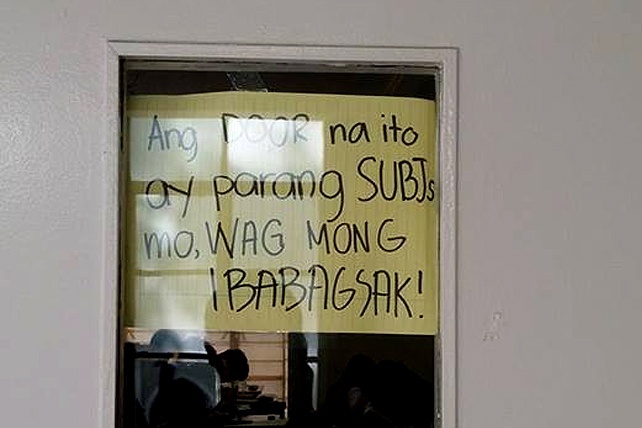 Barely a month has lapsed since the official campaign period started last February 9 but at least 15 candidates for national posts have already acquired more than a third of a billion pesos worth of ads -- or P373 million -- from leading television network ABS-CBN alone, according to advertising contracts submitted to the Commission on Elections (Comelec). Seven of the 15 candidates come from the apparently richly funded Liberal Party of President Benigno S. Aquino III. These early birds in the pol ads war include three candidates for president, three for vice president, and nine others for senator. Yet while candidates in the May 2016 polls may get a free pass from still porous election laws for their pre-campaign ads, they may have a hard time escaping from the legal and administrative liabilities that they and their donors may face, by the text and letter of anti-graft, civil service, and tax laws. Laws do not sleep or lie in wait during election campaigns, and in the view of four regulatory agencies – the Commission on Elections, the Bureau of Internal Revenue (BIR), the Securities and Exchange Commission (SEC), and the Office of the Ombudsman – these candidates and their donors have some serious explaining to do. 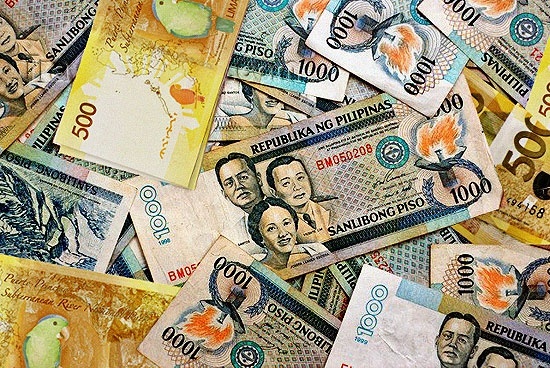 Anti-graft laws prohibit all public officials from receiving or accepting gifts of "manifestly excessive" value. Doing so is a possible case of "indirect bribery." on the part of both the candidate and his/her donor, according to Comelec Commissioner Christian Robert Lim, head of the poll body's Campaign Finance Office. Internal Revenue Commissioner Kim Jacinto-Henares, meanwhile, told the PCIJ she would be keen to find out if those who paid for the candidates' pre-campaign ads had remitted the 30 percent donor's tax due from donations from "strangers." * Manuel 'Mar' Roxas II of the Liberal Party, P969,173,267. * P2,776,000 for GP’s Francis ‘Chiz’ Escudero. In the meantime, many wannabes for Senate seats bought millions of pesos of pre-campaign ads as well. Topping the list is Bongbong Marcos’s cousin, Leyte's 1st District Rep. Ferdinand Martin Romualdez who acquired twice more ads than the former, P502,392,924, from August 2015 to January 2016. He is serving his third and last term in Congress. 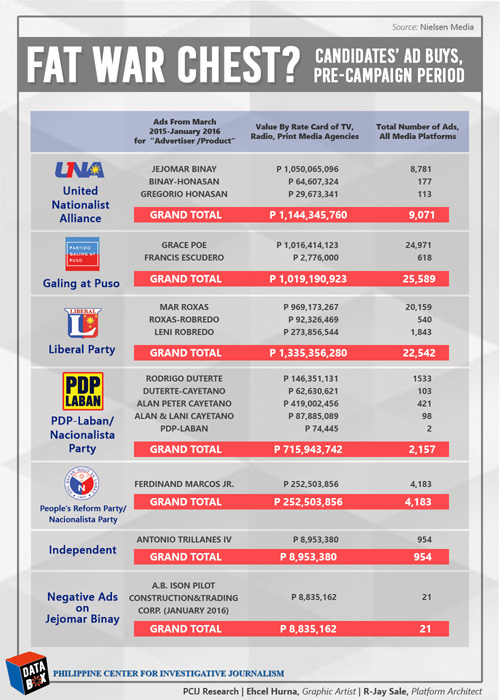 As a group, these candidates for national office accounted for P6.69 billion or 86.38 percent of the P7.75 billion in total “social concerns" ads purchased from TV, radio, and print media agencies, from January 2015 to January 31, 2016.